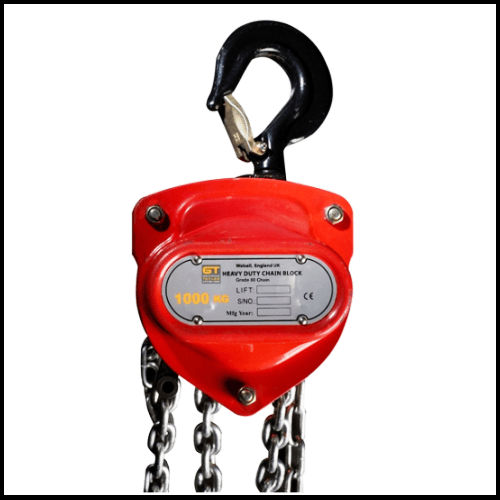 GT Manual Chain Hoists are heavy duty chain blocks with lifting capacities available up to a whopping 30 tonne. GT chain blocks are possibly the most cost efficient means of lifting with a manual device. As GT are highly respected for safety and customer satisfaction with their products. You can be assured of a quality manual hoist fit for purpose, having undergone quality testing and conforming to all the necessary regulations and standards. We supply GT chain blocks at the most cost effective prices direct to you. We can chain up the hoist with any length of chain to suit your requirements. 3, 6 & 10 meter lengths are the usual standard lengths. We have been supplying our customers with the GT manual hoists for many years, as well as using them ourselves in our own factories, which is testament to a good product. A simple but very effective piece of lifting equipment which does exactly what it says. Never use a chain block to lift people or to lift loads over people. Take a look at our range of GT manual chain hoists and contact our sales team if you require more information.